February 13, 2016 | Posted in Open Frameworks, Utilities | No Comments. I recently purchased a HP7475 Pen Plotter from ebay for about $110 with shipping. I love that this printer uses physical pens that are dragged on paper to make marks. The marks have the inconsistencies that arise when drawing with a pen on paper and they are beautiful. The first step was talking with the printer from my MacBook. This printer was initially released in 1983. Several people have detailed steps about sending printer commands from a modern computer. The printer uses a language called HPGL that is rather straight forward. 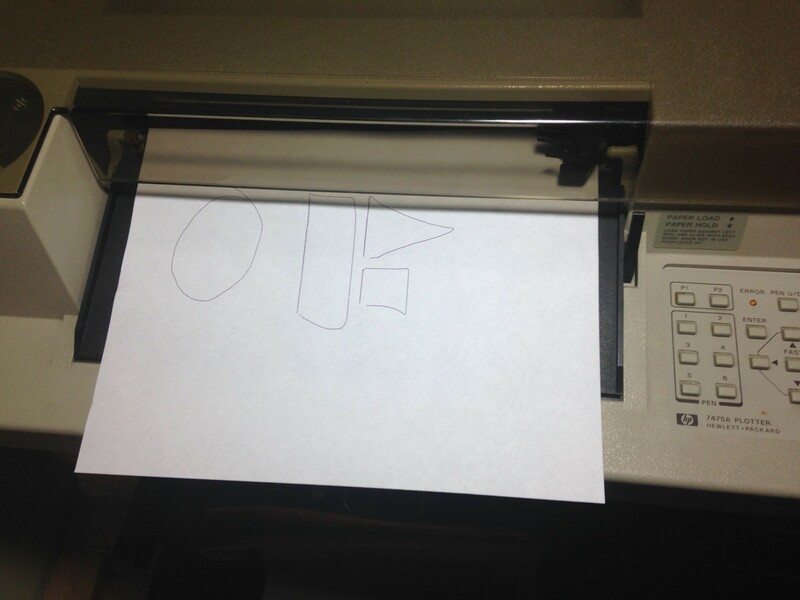 The above links provide several different ways to communicate with the printer. I want to use OpenFrameworks to communicate with the printer and the above methods seem overly complicated to achieve this. Add-on time! The original manual is online and there is a cheat sheet for some of the printer commands. I wrote ofxHPGL to communicate with the printer and it’s rather straightforward. The serial buffer on the printer is super tiny, so there is a sleep millis in there so that the buffer doesn’t overflow. If the printer starts acting weird, that is usually the issue.